The onslaught of Brit's running to the defence of the NHS against US attacks during the Obama healthcare reform debate must leave american's wondering what the hells going on, perhaps the NHS is far better than they were led to believe?. However what is missing from the equation is the fact that over 1 million people in Britain ride the NHS gravy train and hence have a vested interest in the continuance of this sacred cow funding black hole that continues to exert a sizeable political force that political parties have little choice but to pander towards to ensure electoral success. Even Margaret Thatcher in a choice between reforming the NHS and implementing the Poll Tax, opted for the latter on fears that she may have taken on more than she can chew by the former. Over the past 10 years the Labour party that has literally risked bankrupting Britain to ensure that the millions that ride the NHS gravy train are kept sweet now to the tune of £120 billion per annum, which is more than triple the budget when Labour came to power. Now, with the debate across the atlantic raging over Obama's proposed healthcare reforms that are generating many criticisms of the NHS as an alternative to the American existing system of healthcare, this has led to an unprecedented avalanche of defence of the NHS with twitter accounts of those that criticise the NHS assaulted by thousands of replies out of the pool of the 1-2 million that profit from the NHS funding black hole that the NHS has become under New Labour. Even the Prime Minister, Gordon Brown with an eye on the army of voters during an election year has stepped in to post short comments in its defence. Meanwhile the Tory party of have been eager to rebuke any of its members over in the States that have criticised the NHS such as MEP Daniel Hannon who stated "he wouldn't wish the NHS on anyone." Politicking aside, the fact of the matter is that the NHS is a funding black hole that does NOT DELIVER VALUE FOR MONEY which operates as a post code lottery primarily primarily between affluent and deprived areas of the country which tends to ensure a large annual cull of those that live in the deprived areas of the country due to the fact that health and GP services in the poorer areas are more akin to those in the third world than the first world as the greater the deprivation observed the greater the tendency to under fund health services in those areas as found in the analysis by the Health Service Journal revealed that "of the budgets allocated to GP's to pay for drugs and hospital care for their patients show that the wealthiest tenth of the population are, on average, more than 2 per cent overfunded while the poorest tenth are 2 per cent underfunded. Further analysis of official data from the Office of the Deputy Prime Minister backs this up for Sheffield as the below table illustrates, that deprived wards (red) come bottom in terms of health care provision. The Labour government recognising the disparity in GP services in many areas of the country during 2008 embarked upon a programme of introducing poly clinics or super surgeries. Sheffield's own super surgery situated in the city central opened in April this year, which aims to 'hopefully' bridge some of the ever widening gap between affluent wards and deprived wards of the city. Even today the representative of GP's, the BMA criticises the implementation of Poly Clinics, this despite another report released today that shows that small GP practices generate six times as many disciplinary actions as against larger practices. British MP's were humiliated during May and June across all parties as public outrage and indignation oat the abuse of the MP expenses system with MP's responding with how MP pay has failed to keep pace with that of NHS GP's which is one of the key reasons as to why they had resorted to what amounts to legalised theft from the electorate. When Labour came to power in 1997 average MP pay was £43,722 against average NHS GP pay of £44,000, so both were inline with one another at that time. 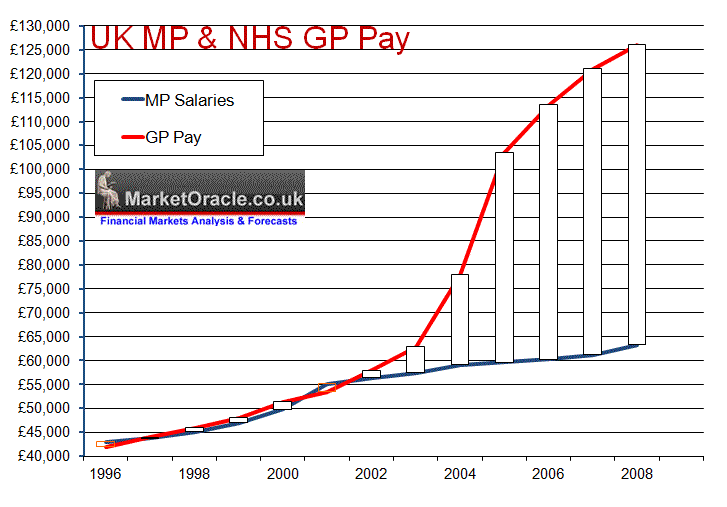 However as the above graph clearly illustrates in 2003 something started to go seriously wrong with GP Pay which took off into the stratosphere as GP's decided to award themselves pay hikes of more than 30% per annum at tax payers expense that has lifted average GP pay to £126,000 per annum against £64,000 for MP's. How could this happen, unfortunately this was as a consequence of the now infamous GP contracts where basically devious greedy GP's hoodwinked gullible incompetent Labour government health ministers into signing upto contracts which were meant to deliver greater value for money for the tax payer but were designed to do the opposite and resulted in GP's pay doubling whilst at the same time cutting back on hours worked. This was not only a total fiasco for the nations health and finances but also ignited jealousy amongst MP's that directly led to the adoption of the policy of claiming expenses to the maximum so as to fill the ever widening gap between MP's and NHS GP's, as MP's could NOT get away with awarding themselves pay hikes of 30% per annum without losing their seats at the next general election in response to voter outcry, therefore across the board systematic abuse of expenses started to take place which basically means real average MP pay is currently approx £98,000 per annum. According to the National Audit Office, the number of NHS GP's has increased by 15% from 26,833 to 30,931 since 2003, this is as a consequence of the GP contracts debacle, at the same time GP's are working on average 7 hours per week less, therefore a cut in productivity of 18% on a normal working week and thus on balance resulting in little improvement in patient healthcare despite a tripling in costs, with the National Audit office reporting am actual continuous year on year loss of overall productivity. The government has attempted to address the impact of over payment and reduction in services to the public by the implementation of Super Surgeries, which is an attempt to by-pass traditional GP surgeries that have proved inflexible and resistant to change by means of delivering health care through Poly Clinics or Super Surgeries that aim to provide all in one centre's with better management of GP's so as to deliver an improved standard of diagnoses and preventative care which is lacking under the existing system. An additional major improvement will be in the offering of longer opening times so as to meet the needs of the working population that tends to be ignored by the present GP system where working patients are required to usually take half a day or a full day off work that's IF they are able to get an appointment in the first place. Super Surgeries aim to give the patients the real choice of GP's amongst a number of professionals under strong management guidance, rather than the current system where the GP's are left to their own devices which usually results in diffusion of responsibility amongst GP's within small family surgeries and therefore putting of competent diagnoses to the next GP, with firm management procedures in place to prevent a lax working environment from developing. The British Medical Association (BMA) (Representing GP's) during much of 2008 fought against the implementation of super surgeries by compiling and presenting a petition of more than 1 million signatures to Downing Street against the implementation of 150 ‘Super Surgeries' and for existing GP Surgeries to be protected. The Health Minister, Ben Bradshaw in response lashed out at the scare tactics accusing the BMA of "misleading and mendacious" behaviour in getting patients to sign up to the petition. The mantra of "Free at the Point of Delivery" implies that the NHS is FREE, it is not, the NHS will cost the tax payer £120 billion this year, but what free at the point of delivery does impact upon is in the way patients are treated. The difference between an NHS GP consultation and the private consultation is the difference between the Sun and the Moon, for instance as soon as a patient walks through the door of a NHS GP, they are swiped in as though they are an ATM card earning the practice the requisite fee associated with the consultation and now the GP wants you out ASAP so that the next patient can be swiped in and out, hence why it can take between 5 and 10 visits before a patient receives a proper accurate diagnoses. Many a time the patient can be made to feel that they are wasting the GP's time, until perhaps after the 10th visit when the patient is finally referred to a consultant that makes the diagnoses for better or worse that should have occurred months earlier. Whereas a private GP in recognition of the fact that the patient is directly PAYING for the consultation ensures that both sides seek value for money. The private GP gives far more time to the patient and actually listens to what the patient is saying. The patient is fully prepared to ensure that they receive value for money so under no circumstances would be brushed off with a 2 minute diagnoses as NHS patients can be. Nor is there any question of the patient made to feel that they are wasting the GP's time for the patient has PAID for the consultation and therefore BOUGHT the GP's time. The same could be applied to hospital consultations. There exists an pervading doubt amongst the patient, and in the doctors mind that the GP's time is valuable and thus the patient must put up with whatever the doctor says, even if this delivers worthless 2 minute shoulder shrug diagnoses. The conclusion therefore is that "Free at the Point of Delivery" is increasingly seen as "Free and Worthless at the Point of Delivery". This suggests that the actual consultations should be paid for by the patient in some manner with a view to claiming back, much as many private health schemes function. The French successfully operate a similar pay and claim back system which contributes to the much more effective healthcare system in France. A BBC opinion poll on the NHS revealed that 66% of the population fears deadly NHS infections which claims thousands of lives every year because of failure of basic hygiene measures. As many as 1/3rd of people polled would avoid surgery in an NHS hospital for fear of getting an infection. The NHS routinely KILLs tens of thousands unnecessarily every year, with the number estimated for 2009 put at 35,000 with many more thousands disabled. As mentioned earlier, It may now be lost in the mists of time but there was a missed opportunity during the Thatcher years with regards market orientated reforms of the NHS with a view to putting the patient first, unfortunately of the two remaining objectives for reform during Margaret Thatcher's third term of either reform of the NHS or local government taxation, Margaret Thatcher sought to reform local government taxation by means of the community charge which became to be known as the poll tax and resulted in the downfall of her premiership. Had she chosen reform of the NHS then how things may have turned out differently for both her premiership and for the healthcare of Britain. It is a fundamental truth of today's NHS that the patient does NOT come first, this was made clear in an opinion poll amongst 156,000 NHS staff that found that patient care is not a top priority for the NHS. The government has so far only paid lip service to market orientated reforms and that mostly on the supply side rather than demand side. True market reforms have never been an real option as that would in effect put the power in the patients hands rather than the doctors / consultants. The NHS needs to resemble the private market place where the GP or hospital have to compete to attract patients through a record of delivering good competent healthcare. The medical profession in response to such suggestions state that the patient is incapable of making the decision of choosing who is best to treat them. Instead today patients with serious illnesses have to do far, far more than consult a few league tables and GP / hospital reviews to get competent healthcare, routinely patients have to fight tooth and nail to get effective medical treatment that is denied to all but those with the loudest voices and persistence despite their serious illnesses. Patients are demanding of a more competent and professional health service as the patient is more or less left out of the decision making loop. The key to successful reform of the NHS is to introduce market forces into the NHS, where the money follows the patient right from GP surgeries to hospitals. Thus the healthcare provider is forced to provide competent / good healthcare otherwise the patient will go elsewhere. More so in that GP surgeries / medical institutions reviews and rankings will funnel patients and therefore money towards the better providers of healthcare, and that in essence is the benefit of patient driven market forces. Rather than the present day system where GP surgeries and facilities are maintained whether or not they provide effective healthcare. The NHS in its present form is a funding black hole with falling productivity that is sucking in ever increasing amounts of cash in real terms. Real reforms are urgently required otherwise Britain will be heading for a health service crisis as the GDP share of health spending continues to expand from 3.5% in 1948 to 8% today to above 11% by 2020, all without any real improvement in patient healthcare. In conclusion the money MUST walk with the patient to ensure the patient receives competent healthcare. Otherwise the system is maximized to yield the most money for the least amount of work as we have witnessed with the GP contracts. Therefore a form of health credit card system MUST be implemented where the Patient CHOOSES which hospital or GP surgery to PURCHASE healthcare from regardless of whether it be a government run NHS institution or a privately run hospital, only then will the patient come first and receive the treatment that they deserve rather than the current half way house that costs more and repeatedly fails to deliver the price of which is unnecessary illness and early deaths. Regardless of the finer point, the idea that someone living in Europe who is sick will treated based on the seriousness of their illness not their ability to pay is a good one. It's all part of living in a civilised society - yes, our taxes are higher, but people who work in Walmart are no less human than Wall-Street traders - both work hard and pay their tax and both deserve just as much care when they're ill.
Plus there's the obvious benefit of economies of scale and administration cost savings here in England. Our NHS buys drugs 60% cheaper than the average hospital in the US.... and we don't need to pay for an army of paper pushers to manage insurance schemes. 16 Aug 09, 05:40 Further facts..
"World Health Organisation data shows that life expectancy in England – 78 – is a year longer than in the US and that nine babies out of every 1,000 born die before they reach five in America, compared with six in England, the DoH dossier says." I work in the NHS and I wish it was radicaly overhauled. I think it does provide some minimum level of service. The problem is the level of expectations are sky high and very few people are telling the truth. I have trained also in the US so I know what the system there is like.I think rather than look to the UK as a model the US should aspire to Australina or French system. I see like you a tremendous gap between rich nd poor but also between well staffed and funded teaching hospitals and DGHs (district general hospitals) which because mainly of lack of staff (not managerial ) cannot perform to an adequate level of safety.There is also a real problem in attracting people to do general internal medicine because the job is too tough and you can become a GP for less work and better salary. There is also no incentive to improve services , because of the rigid structure. I would be quite happy to compete in a private structure where my talents would be better rewarded but I think it will be impossible to dismantle the NHS. World Health Organisation data shows that life expectancy in France is 80.87, Switzerland 88.86 and almost every other Western European country is higher than in England. Unlike the socialist NHS model, the health systems of France, Switzerland, Germany etc are all based on insurance models. Why are the hysterical apologists for the NHS so keen to close down debate on this subject? The idea that the rest of the world sees the NHS as the "envy of the world" is completely laughable. How is it that the Left, normally in thrall to all things European, refuse to countenance even a discussion of their health systems? How good of Nadeem Walayat to undertake such a fair analysis of the NHS. I suppose none of the hysterical outcry from America against the Obama proposals comes from those "disinterested" private health care insurance companies and their employees or the pharmaceutical companies?? The NHS costs half the %GDP that your American system does AND EVERYONE receives care. So mind your own black hole. Sure the poor have worse health outcomes - something to do with lifestyle, poor diet and many other factors- I take it that in America the life expectancy of everyone is exactly the same??? Its still lower than UK average life expectancy - so something must be going wrong somewhere with your wonderful system. How many people go bankrupt in America due to health care costs? Sure, the NHS is not perfect, and people like to moan but PLEASE do not have the audacity to tell us that the American system is better for the population than the NHS. It would help if you read my article before replying.